Utility or beauty? Usually the garden is a place where that distinction is clear. Tools are bought for their functionality, gnomes and bird-houses are bought to look good. Wind chimes are for annoying the neighbours. Simple. Well, outdoor clocks straddle both camps. As well as telling you the time, the temperature and (in a lot of cases) the humidity level, they also look good. 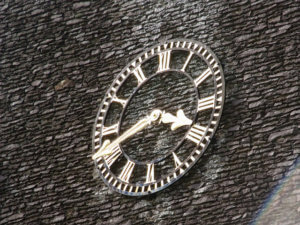 In this article I’m going to delve into the world of outdoor clocks. I’ll also review five of my favourite picks. 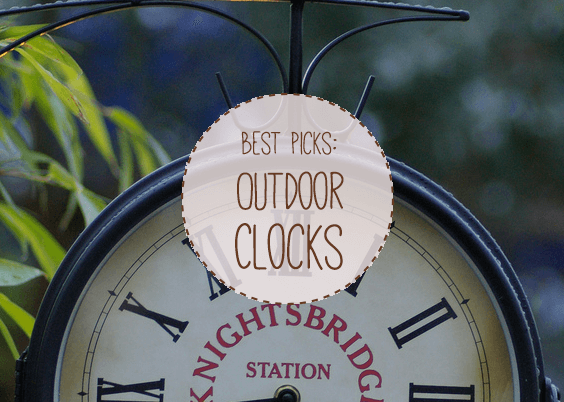 Click here to jump to our in-depth reviews of the best outdoor clocks. What is an outdoor clock? 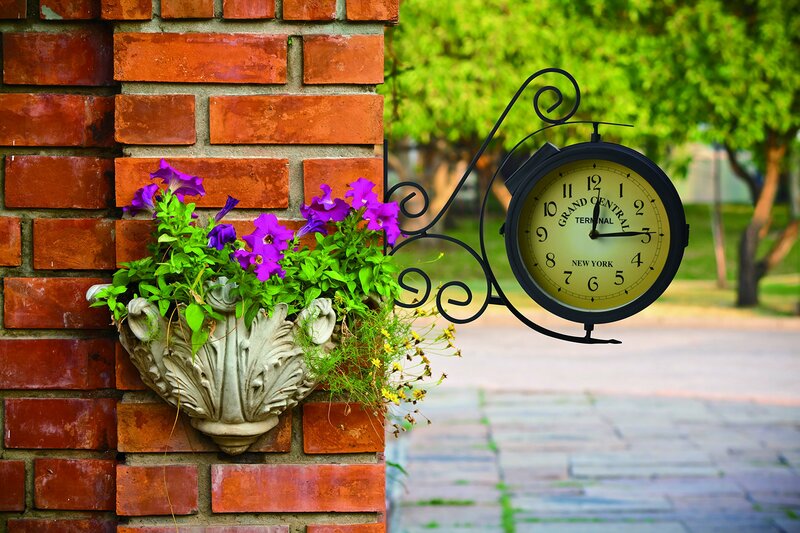 Outdoor clocks are simply weatherproof clocks designed to be hung outdoors. 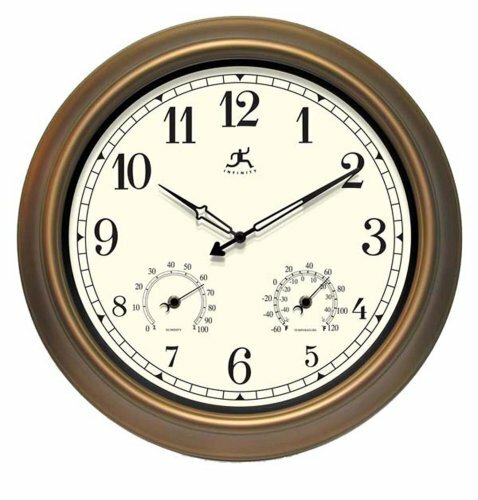 They usually incorporate an analog clock face and often include a thermometer and hygrometer (for measuring humidity). Outdoor clocks can loosely be categorized into two camps, with a degree of overlap. On the one hand there are highly ornamental models, whilst on the other are those meant for purely functional reasons. It’s clocks from the latter group that usually include bells and whistles (thermometers etc.). Skeleton clocks (pictured) are popular for ornamental use. Station clocks (pictured right), so called because they resemble train station clocks, hang from a wall bracket. They’re elegant garden additions. The compact models are also well-suited to smaller gardens. Thermometer and hygrometer – Do you want your clock to tell you the temperature and humidity levels along with the time? If you do, then make sure a thermometer and hygrometer are included. Station clocks will sometimes have a clock face on one side and a thermometer on the other. Waterproofing – As most clocks run on batteries, make sure that both the back and front are well-sealed. Weatherproofing – Make sure that any clock you buy is either made from a rustproof metal, plastic or has a paint or copper/zinc finish. . 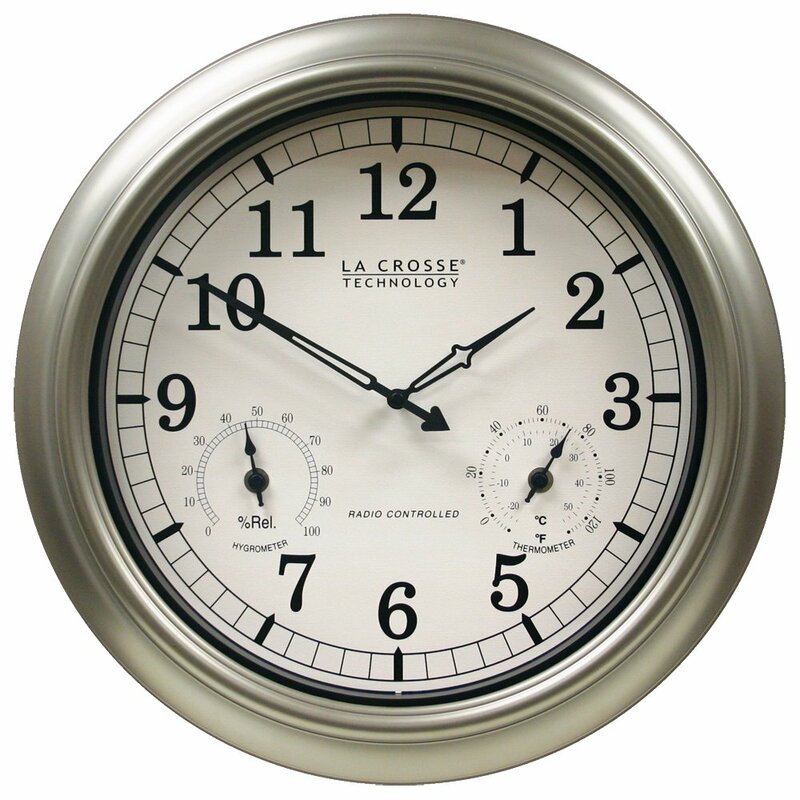 Size – Outdoor clocks can be anything in diameter from a dozen inches/centimeters up to a meter. Radio controlled – This isn’t make-or-break for me – it’s only twice a year, right – but if you’re eager to forget about resetting and adjusting for daylight saving then go for a radio-controlled clock. Colour – There is a whole range of unique colour designs available, from copper to wood to white plastic. Finding one that fits with the theme of your garden shouldn’t be an issue. 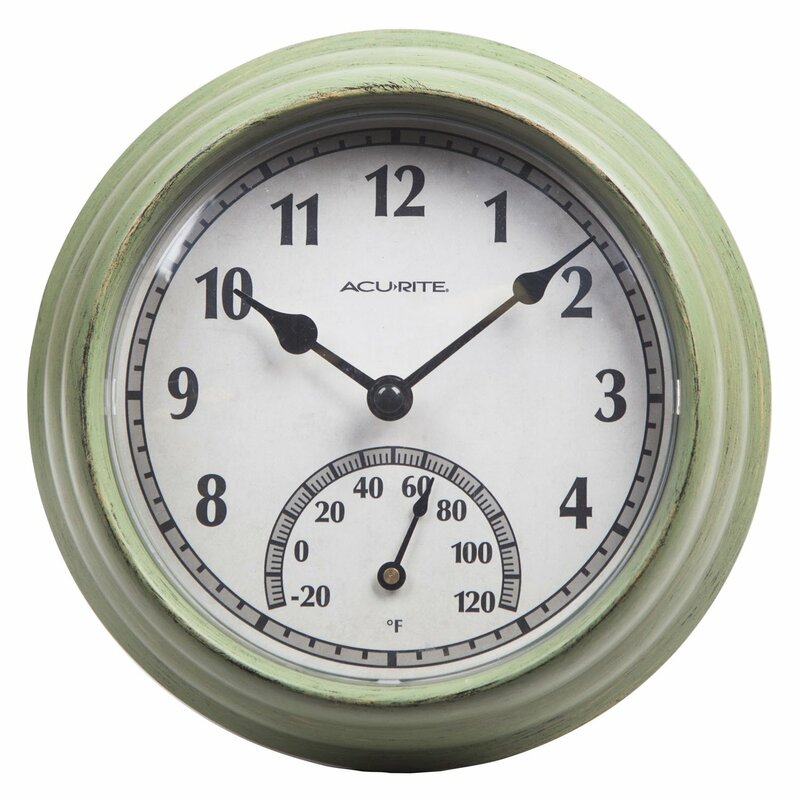 This clock from La Crosse, a company that makes a range of stylish gardening products, is absolutely top-notch. A lot of outdoor clocks, including this one, are 18 in. in diameter. It seems to be the ideal size – not too obtrusive but still big enough to read from across the garden. Both the screen and the casing are made from plastic. It’s an atomic clock, which means that it regulates itself based on atomic frequency. These are the most accurate type of clock in the world. The time is radio-controlled so you don’t need to worry about daylight saving (4 time zones are available). It includes a thermometer and hygrometer and runs on 1 AA battery. Acurite is probably best-known for its weather stations and indoor/outdoor thermometers. The company also make some fantastic outdoor clocks. This model, which is 8.5 in. in diameter, is for those that are looking for a smaller option. It’s made with a green, plastic frame and a clear plastic lens and is fully weatherproof. The main face also includes a thermometer. It runs on one AA battery and the back panel is well-sealed from the elements. Personally, I think it’s ideal for smaller gardens, patios and balconies. All clocks of this type can be a little susceptible to direct sunlight so a shady(ish) option is always best. This 32 in. 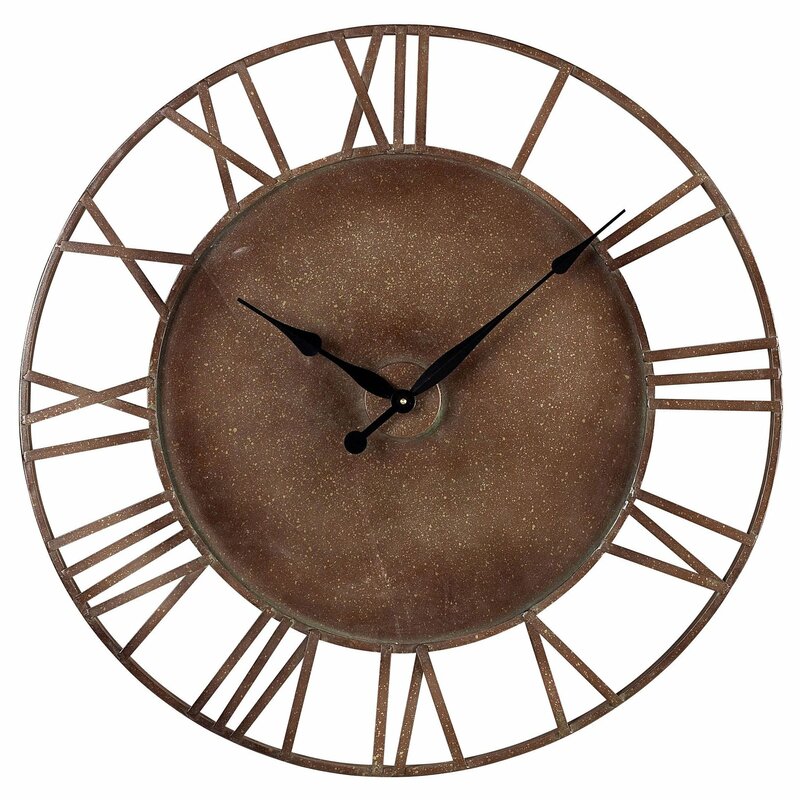 skeleton clock with Roman numerals is ideal for providing a little ornamental flair to your garden. The reason I like it so much is because I think its minimal and beautiful without being kitsch. It’s also just the right size for making a statement. It’s made from metal and has been finished with dappled copper-imitation paint. The back is fully sealed and so protected from rain. It requires 1AA battery to run. 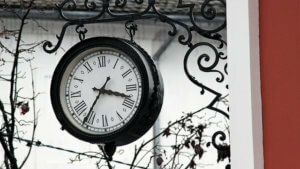 If you are going for an ornamental metal clock make sure that it’s OK to put them outside. Most are made for indoor use so it’s always worth double checking. I knew before I even started putting together this list that I wanted to include a solar-powered entry. Nearly all garden lights are driven by solar energy now, so why shouldn’t clocks be? I don’t think it will be that long before we have solar-powered gnomes! If you like the look if station clocks (as I do), then this model is for you. It’s made from powder-painted metal and includes one solar panel. The clock itself is run on a rechargeable battery (included) whilst the back light is solar-powered. The reverse face is a thermometer. I think that the “New York Central Station” text and faded yellow background is a nice rustic addition. This offering from Infinity, a company that deals exclusively in clocks, is a robust and sturdy model that comes with everything you would expect. It is 18 in.in diameter and is 2.5 in. deep. It comes with a hygrometer and thermometer, both on the main face. The casing is made from copper (with an artificial patina) and the front screen from durable glass. All of the faces can easily be set with the knobs on the back. The other great thing about this clock is that, like most of the other entries on this list, it only needs one AA battery to run. It comes with a 1-year warranty. What are your thoughts? Have you tried any of the entries on this list? Do you have your own favourites? Leave a comment and let me know! Image credits: GMT by Ben and Rachel Apps; Hanging lock by Albert Lugosi; The Church of St Mary Magdalene, Sandringham by Elliott Brown; Westminster Great Clock by David Davies. I am having a problem finding a clock that can handle full afternoon sun. The hands stop moving after a couple of days. Think something is “warping” in the heat of the afternoon. Hey Donna, it can be a problem…have you tried one with thick metal hands?